DVD to AVI Converter for Mac provides you with various options to edit your DVD movie including selecting DVD subtitle and audio track, selecting any chapters or titles to convert, trimming the length of each title or chapter, joining the selected titles or chapters into one file, cropping video, etc. DVD to AVI Converter for Mac is a Mac DVD to AVI converter specially designed just to convert DVD to AVI video files for Mac OS X users. 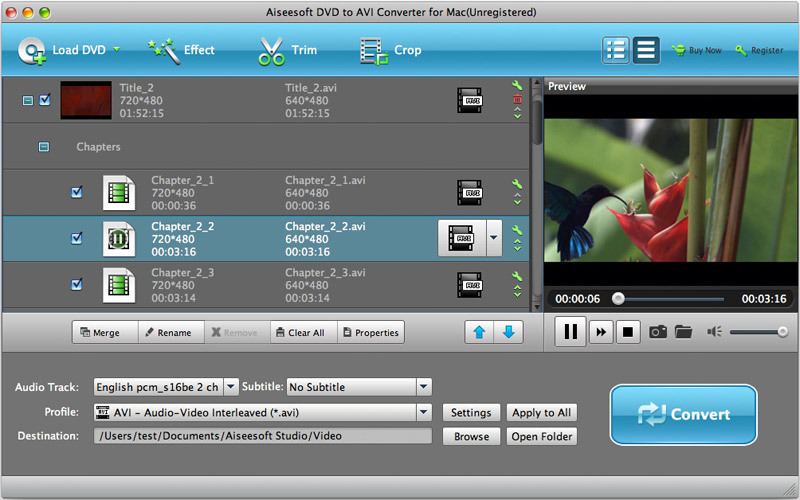 A professional dvd to avi converter developed only for Mac OS X(include Mac OS X 10.5 Leopard ) users. Convert from DVD movies to AVI video files for Mac users with the original quality very well kept. This converter for avi lets you convert DVD to AVI with the language you prefer. Crop your DVD video to remove the video sides. Cut any segment of the DVD into your favorite small video clips by specifying the beginning and end time. • Capture pictures (bmp, jpg) from video. You can capture images by clicking the snapshot button while previewing the dvd movie. Set video brightness, contrast, saturation, and applying a built-in video effect. With the easy Mac-style interface of this excellent Mac DVD to AVI converter, you can copy and compress DVD to AVI on Mac with just a few intuitive steps. Why Choose DVD to AVI Converter for Mac? • MAC OS X (include Mac OS X 10.5 Leopard) or above operating system. • At least 512M physical RAM. • At least one DVD-ROM. • 1024*768 resolution display or higher.